Nature, at it's finest, is when it produces produce- At least I think that. I know,I know, there are more things to Nature besides the yummy fruit, but hey it tops it. Organic, for me, well... you can't come any closer to organic than to pluck the fruit yourself (not using pesticides plays a factor too-I know) but let's carry on. 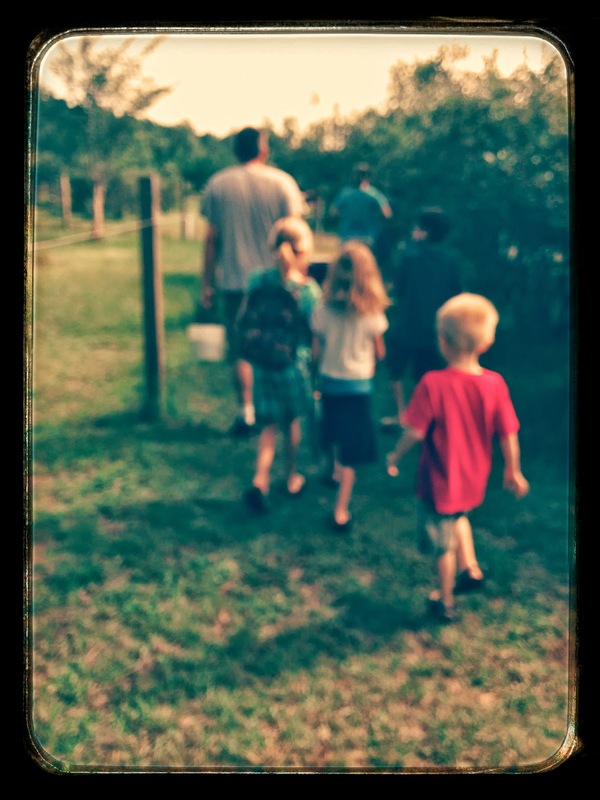 This past Saturday, my husband and I and four of our kids went to a local farm and picked some blueberries. We did it twice last year and this was our second time this year. We're going again next Saturday too. Love it. 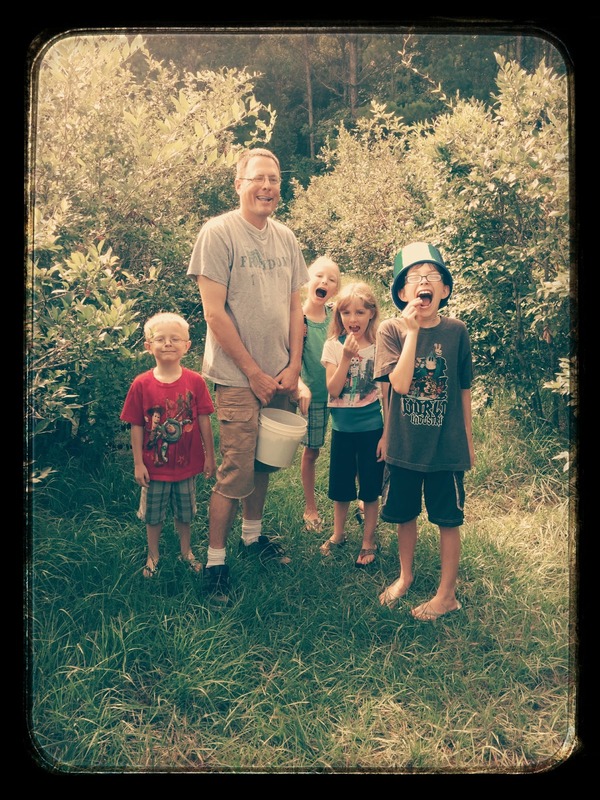 Fun, you get to pick and eat and get great berries at a reasonable price. We're also helping support a local farmer. You just can't beat that. We went early, before eight, the morning so far was cool and the kids were in a picking mood. Yes, there is a picking mood. Kids have to be in this such mood or you get this- "Mom, I'm hot." or "Mom, my legs are tired." or better, "Mom, the grass is itchy and my bucket won't fill up fast like yours and I don't like the bucket tied around my waist, so can you carry mine for me. Look you can tie it right here next to yours..." It goes on. And I still love it all. And yes, I would do it again. I would do it again because regardless of the whining, the itchy grass, the heavy buckets or even the biting bugs (not a problem so far, I remembered the spray), I'd do it again for the quality of time. Life gets busy sometimes. Or maybe we just let ourselves get too busy. Life is as busy as we let it. It also can fly very fast if we let it do that too. So moments like this. Berry picking moments like this, I savor. I savor it like garlic butter on a nice piece of steak that you don't get to eat very often because you are a mother of six plus one and so you are always too broke and can only eat steak about twice a year. Hamburgers are our finest otherwise and that's ok too. I've got a lot of fine memories over hamburgers. Memories. Key word. Memories are the best. They are those special stories planted in our heads to savor like that nice piece of steak covered in garlic butter to enjoy over and over whenever we want and not just two times a year. (I really am OK about eating steak two times a year, it's just funny to reference:0) Get pictures of those memorable moments and it gives visuals to it. Plus it's fun to look back in time. It also comes in handy for later, much later when your memory starts to fail you. I recommend keeping a journal. Writing those stories down to share with the grand kids later. I cannot go on enough about how much I loved hearing the stories my parents and grandparents shared with me in their lives before me. Memories are important and you don't have to go on the most supreme adventures or go broke to create a memorable moment. A cardboard box, scissors and a permanent marker has built a few great memories for my children and who would have believed it?! It's not what you spend or where you go, its how you use that time. That's what matters. Not everyone can do the theme parks. Not everyone can afford the vacations twice a year. And that's ok. People were making amazing memories before those kind of vacations or parks. Go somewhere local. Go to the beach. Go to a park. Go to the pool. Just go somewhere together. 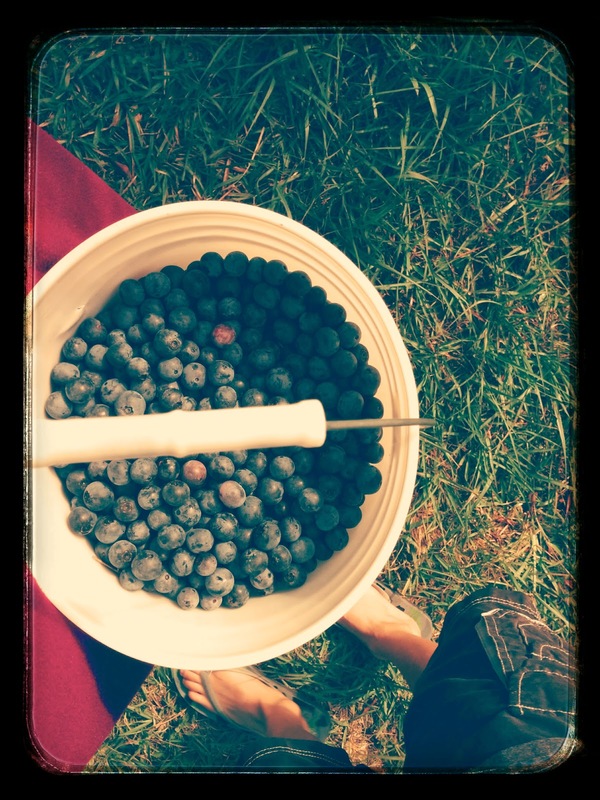 Going blueberry picking with my family, I not only created a memory, got my pictures (cause I just love taking pictures of my family:0) and gained some juicy berries, I got that togetherness. I slowed down our lives just a little and got to spend some quality time with the ones I love. Family is essential to a quality of life. Humans are not meant to be alone and no family isn't just blood related. Friends are family. The craziest of friends make the best type of family.